Haven't posted an entry for a while because Carol's camera was missing. It surfaced this morning, in a carry bag under a load of stuff in the boot of my car. 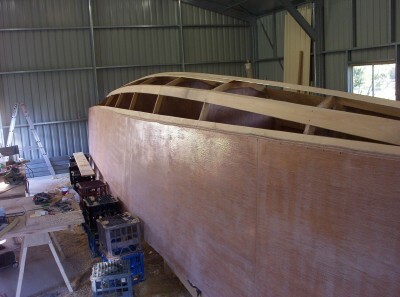 The hull is nearly ready for the next lot of plywood. With work and my tennis elbow, progress hasn't been spectacular, but it's still going forward. Went to the sanctuary cove boat show and checked out the few upmarket cats on display there. Got a few ideas for internal fitout. One side of the hull is sheeted - topsides only, and half the other side. The scarfing joints seem to work well when they can be glued on a flat surface. I've also started fairing up the chines and keelson ready for the rest of the sheeting.